Remember when I posted about my sunroom eleventy billion years ago? It was right before Christmas and I didn’t take great shots because my Christmas decorations were up, and I love you all but I don’t love you enough to take my entire Christmas tree down and do a photo shoot and then put it back up. Well, what the world’s longest run on sentence ever is trying to tell you is I had to take a few shots of my living room/sunroom area last week for something upcoming that I’m working on (more on that next month) and I thought I would quick share them with you. 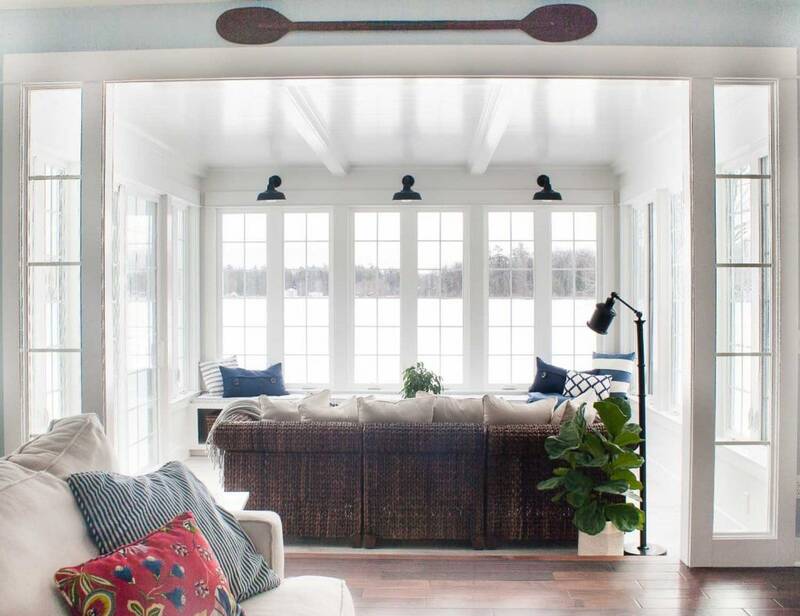 I still need to do to a whole sunroom completed project recap post, but I’m waiting for the lake to melt (crossing my fingers that happens soon!) and the trees to get some leaves, so you can really see how heavenly it is to hang out in this room. Oh, and remember the reader survey? One of the biggest questions I got was where we keep our tv. Here it is! I tend to crop it out of my shots or not shoot this angle so you don’t see it, because, ugh who loves the dreaded large black box? We had specific builtins made in this corner to house the tv, and yes, in hindsight I could have put cabinet doors over it. It’s one of the 100 things I kick myself over, unfortunately, we didn’t leave enough room to have doors that would slide back, so maybe someday when we buy a smaller tv? The Mr. is not onboard with this suggestion. You’ll notice in the above shot, I moved the white love seat that normally hangs out here. I just wanted to show you that the sunroom actually steps down a step from the living room. I had 2 thoughts behind that, 1. it made the flooring transition easier and 2. the view from the kitchen and living room is better having the windows and furniture down lower. I love how the detail of the side transoms turned out. I originally wanted side transoms plus an upper transom, but it would have been too low so we cut that idea. and pardon the bad photos I still haven’t figured out how to shoot this room without it looking like you should “walk towards the light”! We get SO much sun thru these south facing windows and I really wish I was a good enough photographer to capture the gorgeous light in here. I love the furniture in your living room! Where is it from? I got it at a random clearance sale at a local store about 7 years ago, sorry that’s not exactly helpful! Yes, every Sunday afternoon that is my spot! Love it! and I would like to know where you got the blue/white rug? I love your style! 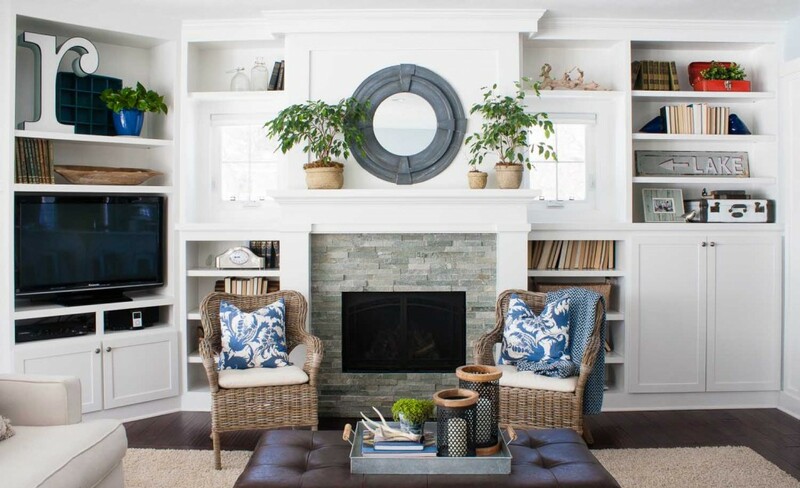 Classy nautical:) I am looking for a small around 12 to 15 inch side table just to put a cocktail on between two leather chairs and I also live near the water but on the East Coast not finding anything ,I was thinking possibly seagrass? Any thoughts for where to look? HomeGoods is always a great spot for tables! Gorgeous! As always,love your style! Hey Shawn I’ve seen that post too and it’s great info! Sounds like you have a plan, have fun! Hi Sam, so I know lots of people who have slipcovered white couches with little ones and they are a dream, just throw them in the wash and you are good to go. Mine unfortunately aren’t slipcovered but I do have them steam cleaned once a year or so. My kids are 3 and 7 and they mostly hang out and do messy project stuff upstairs in the playroom, we do use this room a lot and they really still look great. I am pretty careful about having them wash their hands after messy meals and when they come in from the backyard. Hope that helps! Ha, that is great! I mean we all have one why are we so worried about hiding them?! Yes the dreaded ugly tv! I always look forward to one of your Posts. 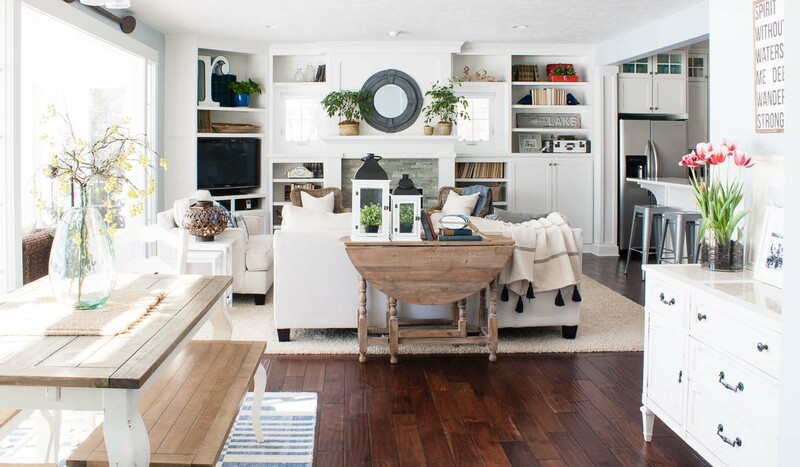 Room is lovely – so crisp and bright looking. You hate laundry; I hate to vacuum. Who would have thought one measly hour could make such a difference. Both my daughters say their kids are also having a hard time adjusting their sleep patterns and my sweet grandkids range in age from 8 – 13. Beautiful! 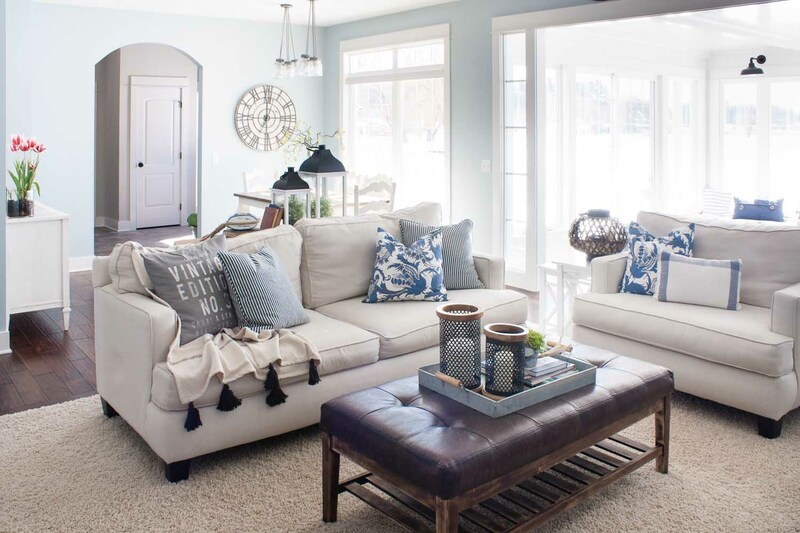 Where is your sunroom sofa from? I love your house so much. It feels so Pottery Barn to me. I’m betting you spend a lot of time in your new sunroom. It’s dreamy! Thanks Emily I do try to hang out in there as often as I can! Your sunroom is so peaceful, I could loose a lot of time in this room and not feel the least bit guilty. It is so very warm and inviting. Your vintage edition no 3 pillow is awesome!! Can you share where you got it? It’s from H&M, from a few seasons ago but they still have similar ones. I love this space! I come back to your house over and over for inspiration as we put our new home together. The view from your sunroom is so beautiful! I’m sure you are so over the snow but I grew up in the snow and sometimes I miss it since we don’t get any here EVER in San Diego. 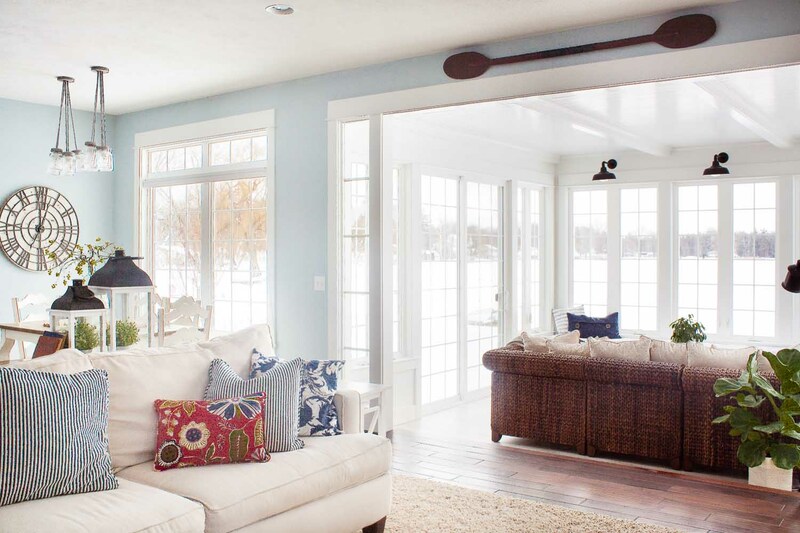 Love the living area with the new addition of the sunroom and all that natural light. Amazing! OH jelly I LOVE San Diego! I’m sure I would miss the snow because I do love it, I just wished it only lasted a month or two. I love it all! The throw with the large tassels is divine! Can you share where you found it? It’s from H&M love their throws I have a few different ones from there. beautiful…that’s all i can say! Love it ALL! So gorgeous. Hi Shelby, they are from Pier One and they are totally faux! I have real plants most everywhere else in my house but for some reason anything I put on this table seems to die. I think it gets too much light combined with me forgetting to water ha. What a beautiful room!! I love all of the light. My favorite part is the side transoms. I’ve never seen them used inside the house before and they are really wonderful!! I also made the same mistake with the TV and no doors on the cabinet to cover it. It honestly only bothers me when we have company over. Even so, I’m working on my husband to agree that they are necessary. You have a beautiful home! Thanks for sharing it with us! Thank you Eileen, thanks for reading! Love your home, but have to admit to having a bit of a giggle to myself when I looked at the last but one photo, the one showing the sofa with the ‘vintage edition’ cushion on, it’s probably just my crazy brain, but the throw that you’ve placed under the cushions with the four tassels on, made me think there were two little girls wearing dresses and little boots, hiding behind the cushions! Let me know if you can see it too, I just laughed right out loud – crazy or what? Very beautiful room. I’m glad you shared images from all the angles with us. I love the blue walls. Oh my! I’m so excited that I found your blog! We are moving from TX to MN and I need inspiration for my home in that kind of climate with seasons. I love to see so much white as in MN that does not seem normal, but I love it! Does it feel too chilly in the winter or cheery? Also, love the gateleg table and a million other things in your home. So beautiful! Thanks Suzanne! I think because I have blue walls elsewhere it doesn’t feel too chilly in winter, at least for me :) I do love it so much more in the warmer months though because the focus really becomes the view outside! Beautiful !! 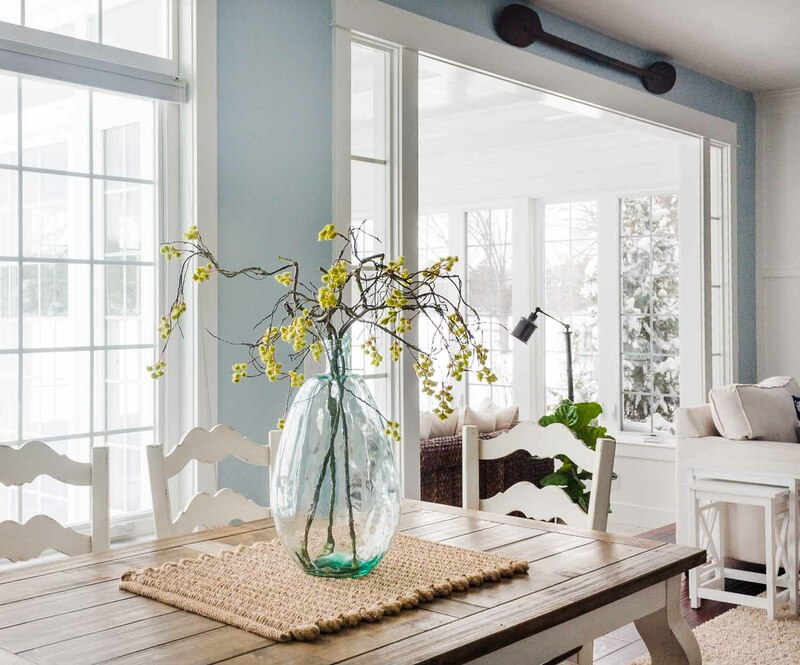 You are so gifted and creative!, lLove how your sunroom turned out! Where did you get your dining room table? I love it!! Your furnishings/decor in the living room are so similar to mine I wish I could send you a photo! 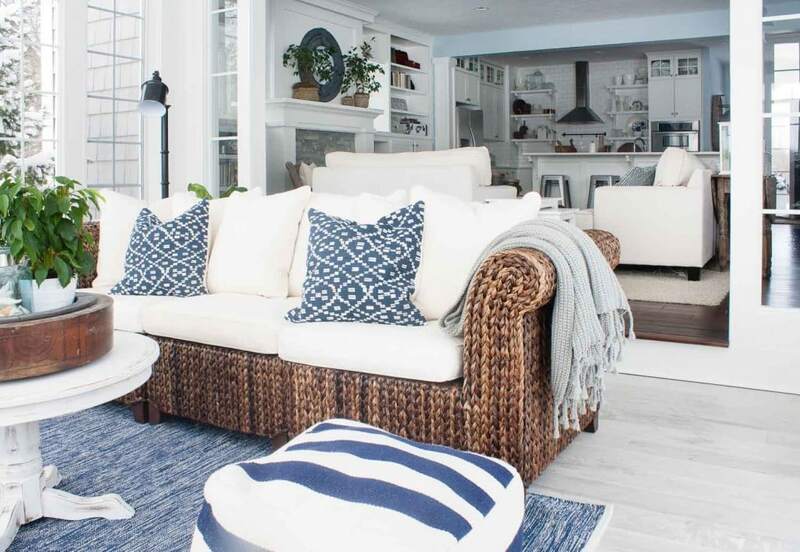 Can u tell me the name of the blue and white rug from rugsusa? I can’t find it and love it!!!!! What is the brand and the name of the blue paint on the walls?